I grew up in Virginia, where strawberry shortcakes are definitely made with biscuits. My husband grew up on Long Island, where he’s said he’d only ever had them with spongecake. 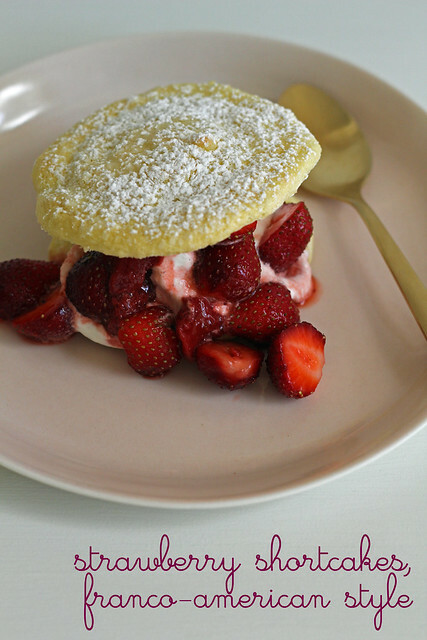 Should strawberry shortcake be a biscuit or spongecake? To each her own, I guess…the star of this show is really the fruit more than the vehicle anyway. With Bastille Day coming up, we TWDers put a Franco-American twist on the spongecake version and gave homemade ladyfingers a try. It’s a softer concoction than the biscuit version I’m used to but it’s delicious, as anything with strawberries and cream really should be. Hubs and I had a little u-pick fun (at least I thought it was fun!) on a recent trip to the farmlands and beaches on the North Fork. The fresh strawberries we brought home were beauties, each one carefully chosen before going into the box. But– my love of roasted strawberries has been documented here already. If you are looking for a saucy berry, they are more intense and delicious when roasted than any stove-cooked strawberry sauce I’ve ever made. I used a combo of the fresh and the roasted for my shorties. You can fancy up the presentation and pipe on your whipped cream with a star tip. I just scooped it on and let the berries run down the sides. I used a golden spoon though, just so you don’t think I’m not classy! For the recipe, see Baking Chez Moi by Dorie Greenspan. Don’t forget to check out the rest of the TWD Blogroll! Biscuit or spongecake – that is the question! One of my favorite shortcakes is from a restaurant in my hometown (in KY). It’s base is a crunchy, flaky, sugar-encrusted pastry. We all enjoyed this one though. Guess I better try the roasted strawberries! 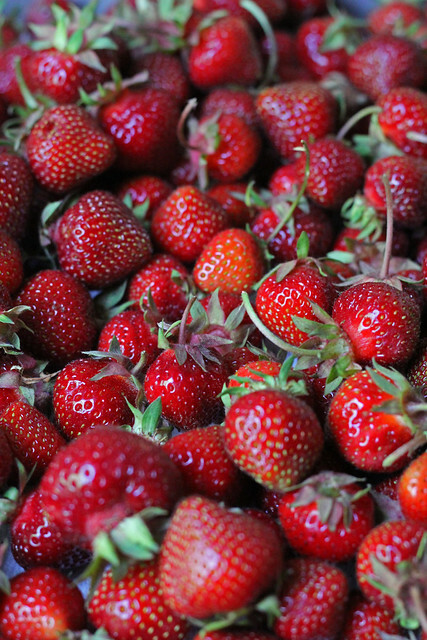 Your strawberries look so bright and fresh. Doesn’t matter what it is with, strawberry shortcake is delicious. We were from NY, and sponge cake is what was used for this recipe. Yours is so pretty – star tip or not! These are some of the most gorgeous strawberry shortcakes I’ve seen! This looks delicious. It is Winter here in Melbourne so I am very much missing my Summer fruits. Both the berries and your shortcakes are beautiful! The berries look so small and yummie and so does your shortcakes. I have to make the roasted version so I can compair. Either way, strawberry shortcakes are wonderful, and yours look particularly toothsome. I grew up with angel food cake and strawberries. I really liked this lady finger recipe. Your strawberries look divine. I am now a fan of roasted strawberries and serving with ice cream sounds like a great idea. Please visit my blog for more recipes guys! Those strawberries look absolutely gorgeous! What a great shade of red. I haven’t tried roasting berries yet, but am excited to see how it goes. I always make my shortcake with poundcake. Is that total blasphemy?! This version was definitely a hit at our house though! That picture with the strawberries looks amazing! No, even though I grew up with the bisctuit version, I now know that the cake wersion is equally delicious! We always used spongecake growing up but I love the idea of using lady fingers. I think we’ll try that with some pretty strawberries we picked up yesterday. Thanks for sharing the idea. Such a perfect summer dessert – and your strawberries look amazing! That color! This was my grandmother’s favorite dessert and she always served them with biscuits (she was half English/ half Dutch) – my other grandmother always made it with biscuits too. However, my mom usually served it with some kind of sponge cake.